Enter to win two tickets here! Your fearless event team: chef Rob Lam, the tablehopper, and Eugenio Jardim! Photo: Erin Conger. Coming up on Saturday June 11th is the final (and sold-out!) 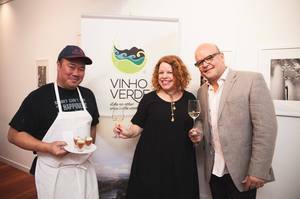 event in a series of Asian “soul food” dinners tablehopper is hosting in concert with Vinho Verde wines, and you can enter to win a pair of tickets! The dinner is once again with chef Rob Lam (Butterfly), who will be cooking a veritable feast of authentic Vietnamese dishes, made with a soigné touch and quality ingredients. The dinner will have a number of Vinho Verde wines paired throughout the meal. Sommelier and Portuguese wine expert Eugenio Jardim will be at the event to educate guests about the wines and region. The event will be hosted in the Mission, courtesy of Feastly. One lucky tablehopper reader will win a pair of tickets to the dinner (retail value $150). Click here to learn how to enter, and good luck! The deadline to enter is Monday May 30th.